• A small BC company called Okanagan Specialty Fruits (OSF) has developed a genetically modified apple that will not turn brown when it is cut, even though 10 years ago, the genetically engineered (or genetically modified, GM) “non-browning” apple was actually driven out of Canada when BC apple growers successfully stopped planned field trials at a local government research station. Nonetheless, the company has now asked Health Canada and the Canadian Food Inspection Agency (CFIA) for approval. When apple flesh is cut and exposed to oxygen, it begins to brown. But the GM apple or “Arctic Apple,” as the company calls it, “will decay naturally just like any other apple, but it will not turn brown from bruising, cutting or biting – not in minutes, hours or days.” In fact, the company president has told reporters the GM apple will not brown for 15 to 18 days. But browning in fruit is not a problem; on the contrary, it’s helpful information. Without this visual cue for freshness, we could be eating apple pieces that are old and decaying. Non-browning is a cosmetic change that consumers have not asked for, especially as we already have techniques that slow browning – in our kitchens, we use lemon juice and the food service industry uses ascorbic acid (vitamin C). OSF is asking for approval to sell two varieties of genetically engineered apples: GM Golden Delicious and GM Granny Smith, but president Neal Carter also says, “Our Arctic program isn’t going to stop with golden and the granny; those are just the first out of the pipe.” In fact, OSF says they are planning to engineer Gala and Fuji apples and also lists “future products” that include cherries and pears with the same non-browning technology. While OSF insists that GM pollen flow will not happen, orchardists like Edwards say, “There is no question that contamination of non-genetically engineered fruit would occur.” The bees that pollinate apple trees can travel a minimum of four miles and while there are factors that can limit pollen spread, they cannot eliminate the risk. Additionally, if the federal government allows the GM apple onto the market, apple seeds from GM trees and from the contaminated fruit from non-GM trees could pose a contamination risk. If fruit on non-GM trees is pollinated with GM apple pollen, it’s the seed that would contain the patented new gene sequences. Apple trees are propagated by grafting because apple seeds seldom create equal or better apples than the parent, but apple seeds can germinate. To illustrate the risk, Harry Burton, who grows over 120 varieties of organic apples on Salt Spring Island, points out that the apple called Poppy’s Wonder was created when a Cox apple seed was thrown in a compost pile in Victoria, BC. Ironically, the BC Ambrosia apple, which happens to be a naturally slow-browning apple, was a chance seedling found growing in Keremeos, BC. I have lived long enough to remember what fruit and vegetables were like before biotechnology started making improvements because of the demands of mass production. I am not impressed with any of these alterations – I have witnessed only a steady decline in the quality of produce in my lifetime and I am tired of fruit and vegetables that look perfect on the outside and are rotten on the inside. No to arctic apples. I heard about this but I was pretty sure the apple wasn’t GM…just bred through selection. Might want to check your facts. I know they are worried people would assume such a product is GM so I guess it could be the bain of their marketing either way. The apples are GM. They are turning off an enzyme naturally produced in the fruit that causes it to brown when it hits oxygen. There’s no way this sort of thing could be developed through selective breeding. The whole thing is simply unnatural. Let’s not even talk about the possible health effects that this may have in the future. Messing with nature doesn’t make any sense. Apples have been around, the way they are, since the Garden of Eden. I can’t think of any reason to change it now. The “non-browning” apple still turns brown after 15-18 days. The economic impact of this would allow the seller control over when to sell its apples. A smart business person would withhold selling his apples when the market price is low. This apple would allow the seller to wait 2 to 3 weeks for a higher price without the concern of the apples looking bad. That higher price would eventually be passed on to the consumer. Additionally, the corporation that purchases the apples from the farmer can also decide not to purchase the apples until offered the right price. 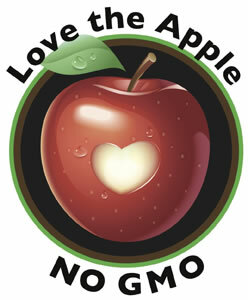 Seems like only the corporate middle man will profit from accepting this GMO apple. Only N/A would come up with another GM crop. Bees travel miles and organic, conventional, now GM can be across the road. Cross pollenation is definitely going to happen. Our bees are in trouble now. We don’t need these apples nor do we want them. I’m confused. If an apple browns quickly, then it’s obviously doing so before it is beginning to decay. How then is this an important visual cue? It can’t both be a cosmetic issue and a sign of decay.